Rancho Cucamonga, CA - The Los Angeles Dodgers have officially announced their minor league assignments, including the Rancho Cucamonga Quakes 25-man roster. Highly-touted outfielder Yusniel Diaz and 2016 Cal League All-Star Erick Mejia headline a group of 12 players that appeared in a Quakes' uniform last season. Diaz, ranked by Baseball America as the Dodgers seventh best prospect in their minor league system, is one of five players on the Rancho roster, in Baseball America's Top-30 rankings for the Dodgers. The 20-year-old outfielder battled injuries throughout the season, but played in 82 games last year for the Quakes, hitting .272 while driving in 54 runs. Mejia, led the team with 24 stolen bases, batting .287 over 124 games, while playing both shortstop and second base. Catcher Will Smith, another first-rounder, returns to the Quakes for a second season, as he checks in as the 16th ranked prospect. Reliever Mitchell White, who appeared in a few games down the stretch for Rancho last year, will open the year for the Quakes as the 19th-best prospect, according to Baseball America. Outfielder DJ Peters (#21) and infielder Omar Estevez (#24) will be making their first trip to Rancho Cucamonga, respectively, as both come highly rated. Infielder Drew Jackson, who played for Bakersfield in 2016, was acquired this offseason in a trade with the Seattle Mariners and was ranked as Seattle's 7th-best prospect prior to the trade. Other position players on the Rancho roster include returning outfielder Ariel Sandoval and returning catcher Garrett Kennedy. They join infielders Ibandel Isabel and Brandon Montgomery, as well as outfielders Logan Landon and Luke Raley, who will all be first-year Quakes. The Quakes have many familiar faces on the pitching staff, as seven of the 13 pitchers on this year's roster saw time in Rancho last year. Adam Bray, Kevin Brown, Alex Hermeling, Gavin Pittore, Chris Powell and Mitchell White join lefty Wes Helsabeck, as returners to Rancho. Left-hander Julio Urias, who pitched for the Quakes in 2014 and again in 2015 will open the year on the Quakes roster. Newcomers include lefty Caleb Ferguson and righties Andrew Istler, Dean Kremer, Dennis Santana and Shea Spitzbarth. Former first-rounder Walker Buehler, who is scheduled to be in the Quakes rotation and pitch against Inland Empire next week, will open the year on the Extended Spring Training roster in Arizona. The 11th-rated prospect by Baseball America is scheduled to be added to the Rancho roster prior to his start in San Bernardino. 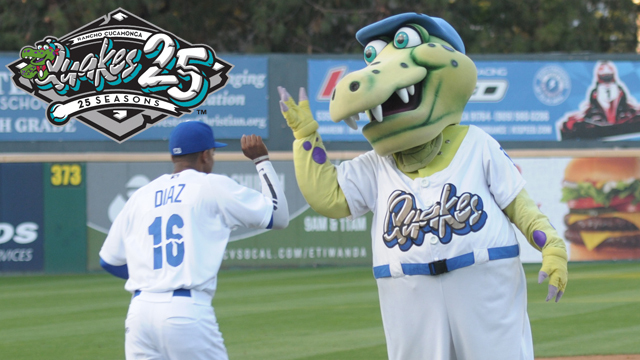 The Quakes will open on the road this Thursday in Stockton, but return to LoanMart Field for their home opener on Thursday, April 13th, as they host the Lake Elsinore Storm. Thursday night will feature a post-game Fireworks Celebration, thanks to Loma Linda University Children's Hospital. In addition, Opening Night is also a Thirsty Thursday, with $2 Pepsi products, $3 16-oz domestic drafts and $4 16-oz premium drafts, wine, champagne and margaritas. Everyone will also take home a 2017 Magnet Schedule, thanks to Allstar Kia. Gates open at 6:05pm and game time is 7:05pm. Tickets are available for the Quakes' home opener by calling (909) 481-5000 and online at rcquakes.com. Season Ticket packages and group packages are also on sale now! All games can be heard live on Fox Sports AM 1350, via iHeartRadio or live through the Quakes' website or on your smart phone, via either the TuneIn or iHeartRadio applications.